High speed video is everywhere these days, but the cameras and necessary equipment is a bit out of reach for a hobbyist. [Bassam] found a compromise and came up with a way to shoot high-speed photographs using a sound triggered flash. Here’s a flash trigger with a programmable delay. These triggers are often used to capture quick events like a balloon popping. The technique takes place in a dark room with the shutter open. When the event is triggered the flash illuminates the scene and an image is captured. Because these require precise timing it has typically been a chore to synchronize the event, hence solutions like using a pressure plate. This build, which centers around a PICAXE 08M, allows the photographer to use any trigger they desire, but adds a delay. The box above shows the apparatus set up for a 42 millisecond delay. So if you’re using the sound of the balloon pop as a trigger, you can hold the flash off until the event really gets going. Reader [Adrian] picked up a couple cheap wireless flash triggers on eBay. Unfortunately, his Sigma EF-500 DG Super strobe doesn’t have the necessary sync port to make use of these. He popped the device open to try to figure out a way to trigger the device manually. The first idea was to use the test button to fire the device. Thanks to lag, it didn’t work for anything under 1/20th. The solution was to go straight for the optical trigger. [Adrian] has posted some teardown pictures that will help you determine the appropriate solder points for your own mod. The only bit that’s left is adding a 3.5mm mono headphone jack as a sync port. 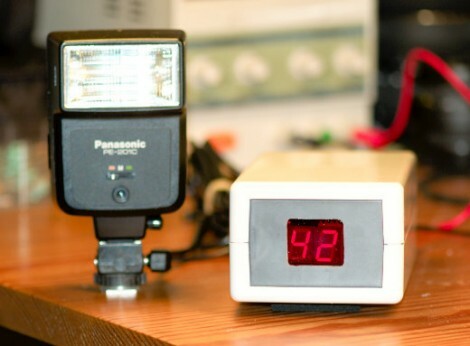 He also has a post on modifying the flash for greater head movement.